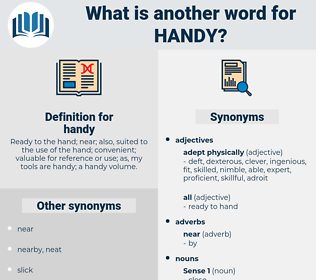 What is another word for handy? 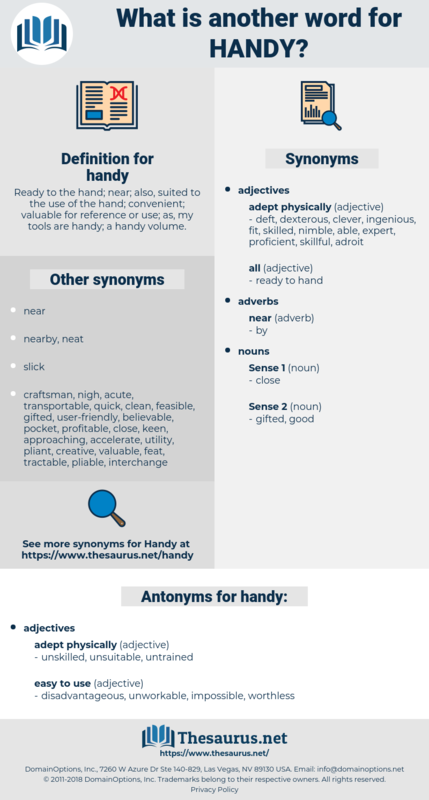 skillful, handbook, appropriate, handwritten, worthwhile, valuable, clever, skilful, serviceable, expedient, skilled, hand-held, meaningful, suitable. clumsy, faraway, bungling, inconveniently, inconvenient, useless, inept, awkward, hard, unavailable, Unhandy, bumbling. graceless, untouchable, gawky, klutzy, handless, stilted, fumbling, unapproachable, uneasy, inexpert, far, unaccessible, ungainly, unreachable, uncomfortable, far-off, heavy-handed, stiff, wooden, ham-handed, incompetent, butterfingered, ungraceful, shiftless, away, unattainable, unobtainable, removed, incapable, remote, untaught, gauche, distant, uncoordinated, helpless. It'll fit in right handy to mend yore shirt with, maybe. If there isn't a club handy the next time you feel like doing anything of that kind I'm going to leave you severely alone.